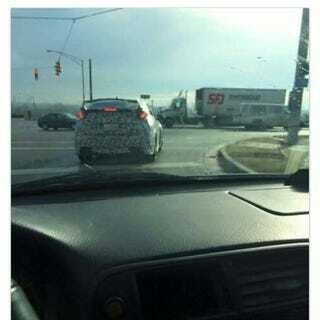 Days ago, this camouflaged prototype was seen in Ohio. The test mule has a rear wing and backlights that looks so next to the ones firstly seen at Civic Type-R concepts unveiled last year in Europe. Maybe, if the photo is real, this can confirm the return of the Civic's hatchback version to US, and finally the arrival of the Type-R moniker at US coasts. The new Civic's range will be unveiled next Spring, probably in the 2015 New York Auto Show. Cazado el primer prototipo del Honda Civic Type-R con carrocería hatchback en Ohio, USA. Last week, Honda oficially confirmed at NAIAS the production of the new Earth Dreams 2.0-liter VTEC Turbo engine in Anna plant, Ohio.